I have another blog challenge which is to describe your day or your year....given that for the most part the minutiae of my day is pretty boring...extend that to a year and you get 365 days of the same. I think that I would like to tweak it a little and talk about the development of a design in lace. I have a series of 10 lace scarf patterns in the Forest Scarves Series which were all inspired by aspects of the forest - trees, leaves, flowers, ferns, ponds, streams etc. I have created from this grouping a power point presentation on the design process which I am now expanding into a group of lessons. The original idea for the presentation came about because when I was discussing Tree Scarf, I described how I saw the bark of a Maple Tree and wondered how I could translate that into lace. To properly illustrate the idea, I needed pictures. Of course, I didn't just stop at Maple trees; but took pictures to illustrate the inspiration for all 10 scarves!! In collecting these pictures I subsequently saw lots of different types of bark, not to mention mosses and ground covers, evergreens etc. I decided to limit my lessons for the moment to "bark" - this could grow. I have started by working up lace swatches with stitches that I think would lend themselves nicely to several of these bark patterns. The first one that has really taken hold is a design from the bark of the Sycamore tree. 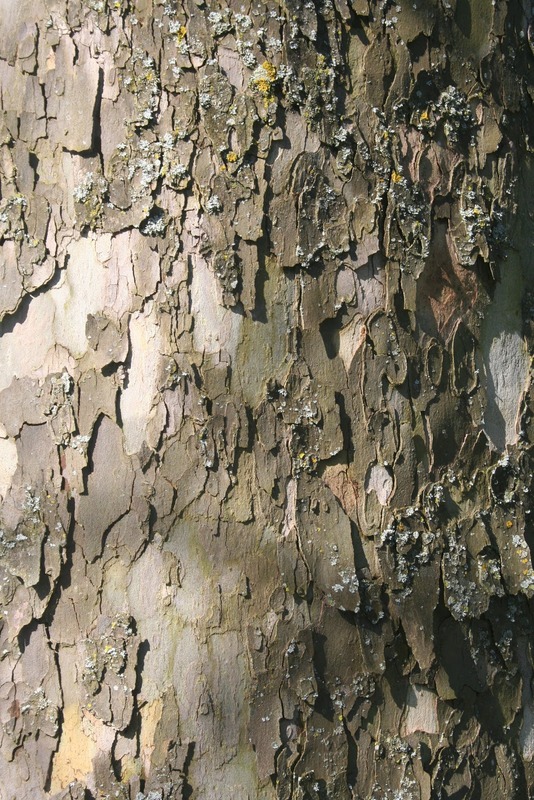 Here is a picture of the bark. And here is the scarf in progress using one stitch that I saw in a stitch dictionary. 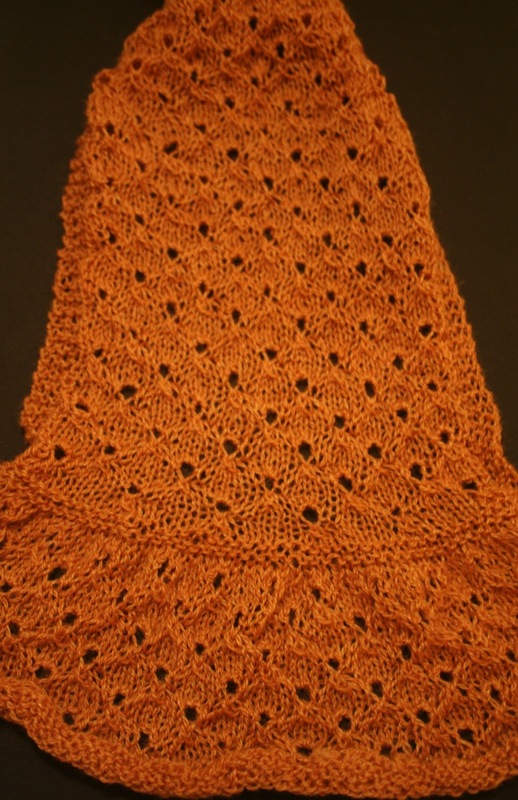 However the instructions for knitting the stitch were wrong; so I had to re-work the lace to get something that looked like the picture in the book. It isn't all about finding an interesting stitch. A lot of design is also making that stitch or a variation of it work with other stitches and with the basic construction of the scarf. I decided to do a cast-on; knit to the centre construction, starting with a ruffle and decreasing for the main part of the scarf. 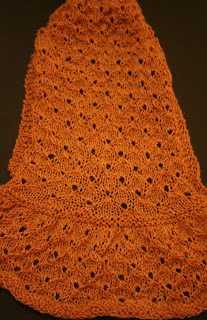 I used the same stitch in both the ruffle and the main part of the scarf, partly because I really liked the stitch and partly because I didn't want to take away from the bark's pattern which is very complex. I just wanted to enjoy the intricacies of the one stitch/bark design. I just have to finish the scarf - I'm on the second half already and I'll join the two sides with a three-needle bind off and Voila - I am onto the next pattern. The second bark pattern I have chosen is that of the Copper Beech tree. It has a story too - next time. BTW - this design process took more than just a day - usually a week to 10 days and then you have to knit the scarf!!! Have a very productive day! This is sooooo interesting! I also love the creative tweak for the challenge. Great job!